I’ve wanted to move to another part of the country for a while now, but this year I actually have the means to do it. As a result, these races are just a little bit more special to me. I may not be here next year to run down the list again. With that in mind, I find myself searching for more than just another race or another clock-time. I find myself calling co-workers to switch shifts for a race, and debating over whether to bring the camera to the course. On the one hand, I desperately want to document the memories, but on the other hand I’d like to leave the distraction behind and go for my best possible race time. I’m almost 35 now, so nostalgia tends to win over athletic ambition. Here are a few photos from my latest race. I had forgotten how beautiful the place is. 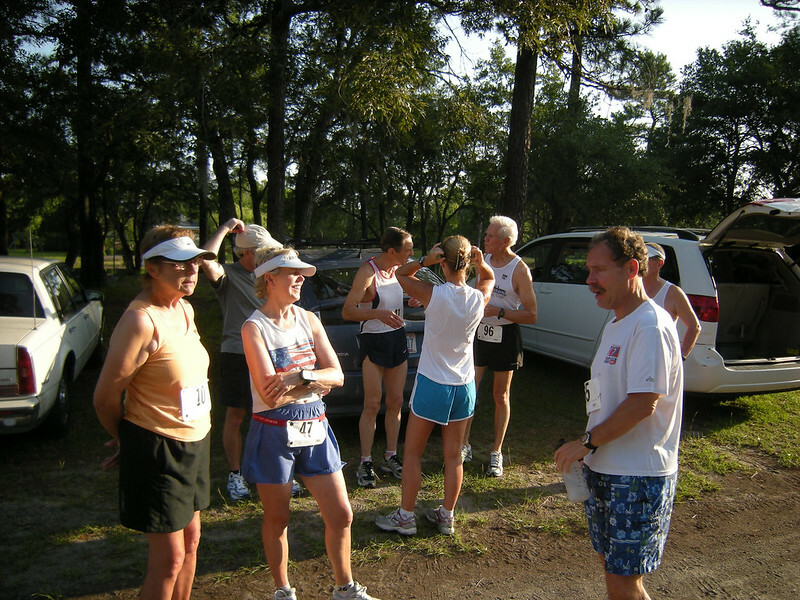 Trophy Lakes on Johns Island, SC was once again the site of the July 4 Cross-Country Run. It was organized by the folks from The Extra Mile in Downtown Charleston, SC. I’ve sort of fallen in love with the shop, really. They’re good people, they know their products, and in their spare time they organize some of the races I love so much. For all of that, they get a heart-felt plug for the store. Of course I saw Joanie again. She works two doors down from my Starbucks, so I’ve made her chai latte a few times. In the first picture below you can see a fellow named Dave. He looks like a normal guy, but when I took the photo below, Joanie as asking him how his “50” was coming along. 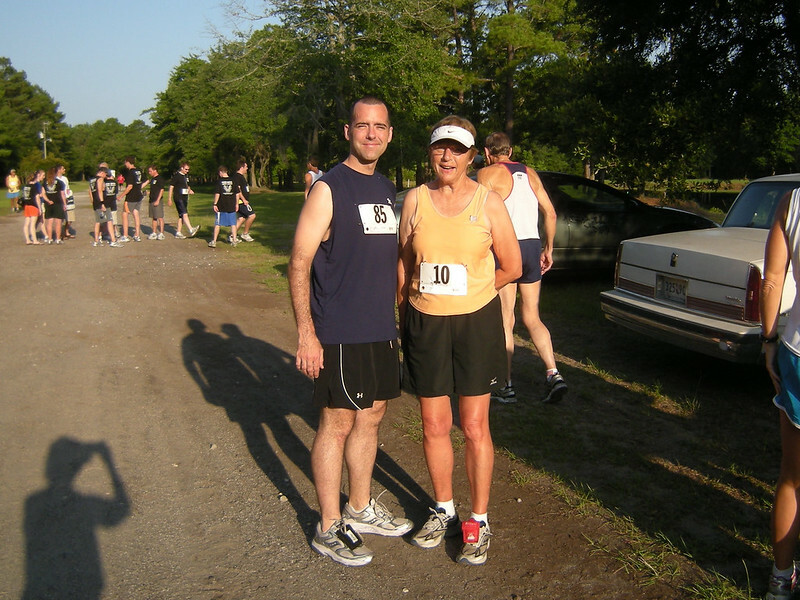 He began to describe the trips he has planned to complete his goal of completing a marathon in each State. That’s right… a marathon in each of the 50 States. I’ve heard them talking about this sort of thing before, but I hadn’t taken notice of everyone’s ages. Look at them. Seriously, look at them. They all think it’s perfectly normal and typical to save up your money for marathons all over the United States, and most of them are old enough to be my parents. Hell, some of them are even doing triathlons. There’s a tangible optimism in that. Could there be a better definition of “aging gracefully” than this? Wouldn’t anyone want to be in this kind of condition as they grow older? I’ll miss them when I move away, but then again… no matter where I go in this country, one of them is likely to show up for a marathon there. Good times behind, good times ahead. Whenever I see her, she reaffirms my belief that complete retirement is bad for your health. I mentioned it to her, and she confirmed that she’s afraid to stop. It makes sense. When you’re starting off your seventies and something is making you stronger… well, I would imagine that you would you to hold onto it. It’s been a hot summer, even for Charleston, SC. Running outside in the afternoon is considered to be kind of crazy in the hottest summer months. People tend to hit it early in the morning or later in the evening. This was an eight-o’clock run, so it wasn’t as bad as it could be. Still, it was a bit difficult when we weren’t under the trees. I can still run in the heat and there’s water available… I’m just saying that it stops being fun after a few minutes. We pressed on, though, and I finished the race in a respectable 24:27. Not bad considering that my schedule has gotten in the way of my training lately. Robert (white hat, gray shirt, mustache) finished maybe half a minute after me, and Laurie (white shirt, blue shorts) maybe a minute after that. Joanie finished in 32 minutes and Donna finished in 45:27. Another race completed, and another t-shirt in my collection. I love this life-style.